With a turbocharger are high torque and hence higher engine performance can be achieved. This is made possible by compressing the air. Because of the higher density with every intake stroke more oxygen can reach the combustion chamber of the engine. A higher concentration of oxygen allows for better combustion – therefore the performance is higher. The heat and kinetic energy of the engine exhaust will be used to drive the shaft/turbine wheel of the turbocharger. The shaft/turbine wheel operates the compressor wheel. This compresses the air which then heats up. The intercooler cools the air down again. Turbochargers are usually on four-stroke engines. A four-stroke engine is controlled via valves. Unlike the two-stroke engine in which all the working cycles during a crankshaft revolutions run, needs the four-stroke engine for a cycle 2 crankshaft revolutions. The piston moves in the direction of the crankshaft (bottom dead center). The intake valve is opened. The air-fuel mixture is formed by the vacuum sucked. The intake valves are closed and the piston moves towards top dead center (TDC). Because now the volume of the air-fuel mixture is reduced, while increasing the pressure and temperature of the mixture. All valves are closed. At the moment of greatest compression, the air-fuel mixture in the gasoline engine was ignited by the spark plug, while diesel will be as high compressed that it is self-ignited. The volume of the air-fuel mixture increases and the expanding gases perform a work in which the piston moves to the bottom dead center (BDC). When reaching the bottom dead center (BDC) to open the exhaust valve. The piston is now moving towards the top dead center (TDC). By opening the exhaust valve the pressure drops to a value close to the outer air. At the end of the Stroke, the exhaust valve close and the intake valve opens. A new four-stroke cycle begins! In order to satisfy today’s requirements for good efficiency, CO2- and noise emissions - turbo charging can achieve all those goals. 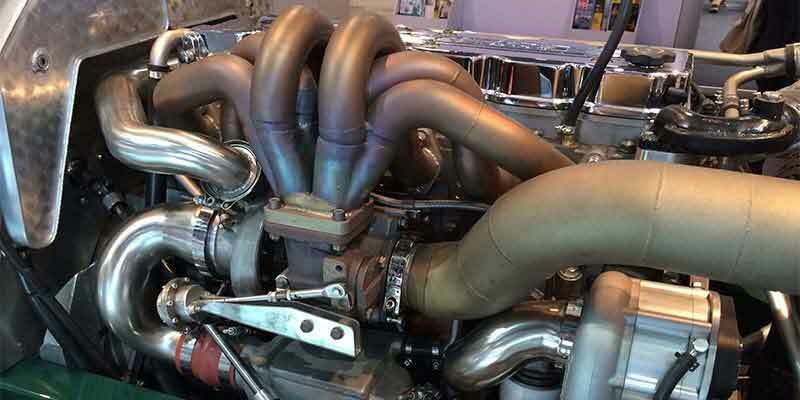 During the turbo charging a big part of the usually lost exhaust energy is being used to drive the turbocharger. The turbine wheel inside the turbocharger is driven by this exhaust energy which will then power a shaft connected to a compressor wheel. The compressor wheel compresses the air intake for the engine. The injection of compressed air increases the power performance of the engine. Therefore supercharged engines can be constructed in a smaller size (downsizing) than the compatible suction engine. This weight reduction decreases the need for fuel. The utilization of today’s turbo charging systems reduces the CO2 emissions through improved filling of the cylinders with the air-fuel mixture under nearly all operating conditions and ensures “cleaner” combustion. All implementations combined are preconditions for low consumption. The pure performance increase for gasoline engines, such as the early model turbo chargers, are no longer needed. Today’s technology concentrates first and foremost on emissions reduction instead.